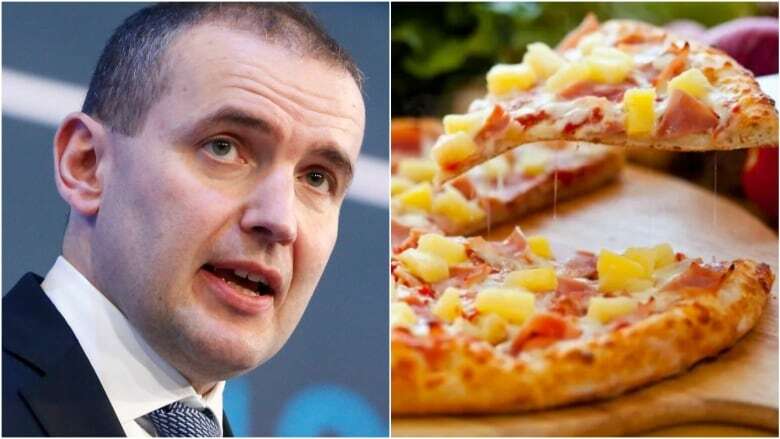 Nearly two years after the president of Iceland drew Canada's ire with his disparaging comments about pineapple pizza, Gudni Johannesson says he regrets his off-the-cuff remarks. During a visit to a local high school in February 2017, Johannesson responded to a student's question about pizza by saying he was fundamentally opposed to the fruit topping and that he would like to ban it. "That's where the influence of this office sort of, yeah, got the better of me," Johannesson told As It Happens host Carol Off during an interview for the show's 50th anniversary, in which he reflected on the divisive saga. "I went a step too far." Prime Minister Justin Trudeau weighed in at the time, issuing a tweet in which he declared himself a member "#TeamPineapple" and stated his support for "this delicious Southwestern Ontario creation." In a February 2017 interview with As It Happens, the famed pizzamaker said of the president: "He should know better. I'm sure he is a lot younger than I am and I was doing pizza when I was a young guy, you know what I mean?" "I had to think it through and sort of calm these stormy waters and I issued a statement, a presidential statement, on pineapples on pizza," Johannesson said. "As much as I do not like pineapple on pizza, the individual freedom of having the topping of your choice overrides that." "I have nothing against pineapples, but when they're put on pizza they get all sort of mushy," he said. Off questioned Johannesson's convenient change of heart about the Hawaiian pizza, telling him: "Sir, we call it a flip-flop." The president replied: "I think politicians in general should be allowed to not flip-flop, but revise, to change their mind. You know, what's wrong with changing your mind?" But the scandal didn't end there. In his revised statement, Johannesson made yet another controversial remark about pizza toppings, writing: "For pizzas, I recommend seafood." That prompted Panopoulos to suggest the president was simply trying to bolster his nation's fishing industry. "I think Sam Panopoulos correctly guessed what was behind all this," Johannesson admitted in his interview with Off. "Iceland are a nation of fisherfolk and, you know, if everyone put seafood on their pizzas, that would be a very nice thing to do," he said. Still, he balked at Off's suggestion he was "in the pocket of big fish." "No, I wouldn't go that far," he said. "But in all honestly, seafood on pizza is good. You should try it."